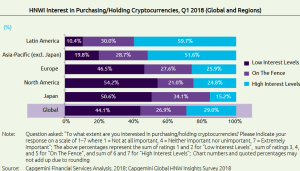 Almost 60% of surveyed high net worth individuals (HNWIs) were showing interest in investing in cryptocurrency in the first quarter of this year, according to Capgemini, a France headquartered business consulting corporation. 29% of surveyed HNWIs were showing high interest, whereas 26.9% of respondents being somewhat interested, Capgemini said in its World Wealth Report for 2018. Also, interest depends on a region: the area showing most interest was Latin America, followed by Asia-Pacific, excluding Japan. Interest in cryptocurrencies seems to drop significantly in other regions, with Japan and North America showing the most interest in not holding any crypto. The survey in January and February queried more than 2,600 HNWIs accross 19 major wealth markets in North America, Latin America, Europe, and Asia-Pasific. Almost 80% of the respondents have USD 1m – USD 5m under control, while almost 2% has over USD 20m and the rest control USD 5m – USD 20m. Cryptocurrency’s potential for investment returns and as a store of value are what’s truly driving HNWI interest, with 71.1% of HNWIs aged 40 and below placing high importance on receiving cryptocurrency information from their primary wealth management firms, compared to 13% of HNWIs aged 60 years and above. “While regulation will play a large role in shaping the future of cryptocurrency, younger HNWIs are likely to force wealth management firms to develop a point of view,” according to the report. However, only 34.6% of HNWIs globally said they received any information about cryptocurrencies from their wealth managers. The report goes on to conclude that the reason for this relative disinterest is price volatility (according to 58.6% of HNWIs). “Given the context of regulatory mis-steps and reputational damage since the financial crisis, many wealth management firms are tending towards being conservative when it comes to cryptocurrencies, at least until they are better understood,” the report concludes. Meanwhile, in a separate report by the real estate firm Knight Frank, published this March, 21% of respondents said clients had increased their investments in cryptocurrencies during 2017, as Cryptonews.com previously reported. Even then, there was little understanding for cryptocurrencies as wealth managers skirted around the subject, deeming it usually a bad choice for broadening your portfolio. Also, the region-based results do not differ too much: Latin America was leading by interest, with Asia on the other end of the spectrum.